On the 8th of June 2017 a workshop was held in Ani Plaza Hotel, Yerevan, dedicated to the problem of chemicals, in particular pesticides, which cause disorders of the endocrine system. 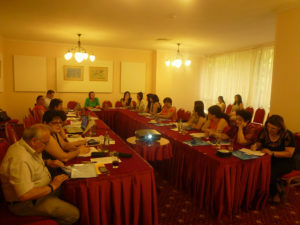 The workshop was organized by the Armenian Women for Health and Healthy Environment NGO (AWHHE) within the framework of the project “Protecting Women from endocrine disrupting chemicals” supported by GGF. Detailed information on endocrine disrupting chemicals was provided by AWHHE employee Ms. Knarik Grigoryan. These chemicals in very small doses can block the action of hormones or can cause disruption in the endocrine system. The availability of information on the hazardous properties of substances and the use of recommended precautions when handling them make it possible to make production, transportation, handling and disposal processes safe. Many countries already have regulatory systems in these areas. In 2002, the international community adopted the Globally Harmonized System of Classification and Labeling of Chemicals. In hеr speech Ms. Elena Manvelyan, Head of AWHHE, got the participants familiarized with the content of the GHS and noted the advisability of implementing this system in national legislation, which will reduce the risks of exposure of such substances to health and the environment. She emphasized the necessity for respecting the consumer’s right to know what chemicals they buy together with the goods. In conclusion, Ms. Manvelyan called for increasing the focus on the issue of chemical safety and working more efficiently in this field, noting that the sound management of chemicals and wastes is one of the most important requirements for sustainable development. Mr. Artur Nikotyan, representative of the Ministry of Agriculture, briefed the participants of the seminar on the strategy of control and protection of plants and agricultural products against pests, use of chemical means of plant protection and their import into Armenia. A wide discussion arose around the question of the possibility of the transition of intensive chemization to agroecological methods of farming. According to Mr. Nikoyan, this transition is still very slow, although Armenia is not a country with very intensive use of chemicals. The results of monitoring about the presence of the residual amounts of persistent organic substances in soil, irrigation water and agricultural products were presented by the representatives of the Center for Ecological and Noosphere Studies of the National Academy of Sciences of Armenia and the American University of Armenia. Ms Lilik Somonyan, AWHHE expert, presented the results of analysis for the content of pesticide residues in breast milk and agricultural products. 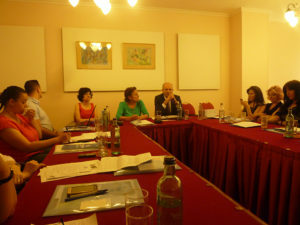 In conclusion, the audience was informed about the results of the International Conference on the three Chemical Conventions by the representative of the Ministry of Nature Protection of Armenia and a member of the AWHHE who were delegates to that Conference.